David Schearl is a young immigrant boy growing up in the slums of New York City in the 1910s. He’s of Jewish descent and lives with his mother and father in the city’s Lower East Side. His father’s rage gets him bounced from job to job, and David and his mother live in perpetual fear of the next outburst. After a series of events show what 5-year old David is afraid of, namely the cellar in his apartment building and women who aren’t his mother, the precocious boy finds out about his heritage in more ways than one, leading to a shocking conclusion. This book was very difficult for me to read. It was almost like the parts I didn’t like the most about Infinite Jest (difficult-to-parse regional dialect), An American Tragedy (buckets and buckets of melodrama) and Go Tell It On the Mountain (rampant theological meandering) teamed up to form Voltron; creating a perfect storm of frustratingly slow reading for me. Roth uses some very specific stylistic traits in constructing the slum New York of the book, specifically the fractured English that the kids in the street use. While I’ve encountered books in this project with some difficult language, this one definitely takes the cake. 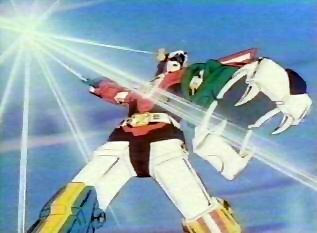 Any excuse, no matter how slim, is enough to show a picture of Voltron. Here the afterword, while liberally strewn with academese, was very helpful to me. Roth has conversations in the book which take place in Yiddish be written down in gramatically correct English, making it feel easy to the reader, and making us want to read those parts more; the intent here is for the reader to feel as David does, i.e. that the only place worth being is at home with his mother Genya. The afterword also says that the ideal reader of Call It Sleep is someone who is familiar with Jewish culture, Yiddish and theology, which makes me 0 for 3. When combined with the fact that most of the people speaking English are little kids, whose grammar isn’t there anyway, this book made for some headaches (especially coming after Infinite Jest, which also had its share of strange grammatical tics, but at least they were spelled correctly). So, yeah, I too longed for David to be at home with his mother. I enjoyed the way Yiddish phrases were dealt out though, they have a great feel to me, but the other half of the book was almost impenetrable at points. 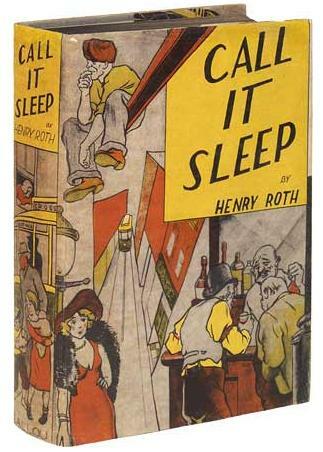 Reading Nadsat was easier than reading this book. Also a guy shows up later on who shares this speech pattern, but with the added bonus of a speech impediment on top of it. Great. This book also comes from the Modernist tradition, occasionally lapsing into stream of consciousness writing to show the interior thoughts of its protagonist. While stream of consciousness is usually okay with me (it’s how I write this blog usually), I found it this time to be a little grating as well. I felt like some of the feelings and thoughts David put forth were way too much for him to have possibly had, especially in the realm of symbolism and metaphor. Maybe he’s supposed to be tapping into the collective unconsciousness somehow, I don’t know. He was a very precocious child. I like the way James Agee dealt with a child’s way of thinking in A Death in the Family a lot better, it felt more like a child’s real voice. It’s been a long time since I was five, though, so perhaps Roth is closer than I feel he was? Who knows. Who would I recommend this book to? : People who are very interested in the American immigrant experience near the turn of the last century, who have a high tolerance for having to stop and sound out words every five minutes. People who enjoyed Go Tell It On The Mountain, and would like to read a similar story, this time set in the backdrop of the Jewish faith. Total pages read since January 1st: 11125 pp.